Featuring installation friendly ezFIT dimensions, connections, and controls in your choice of Natural Gas or L.P. 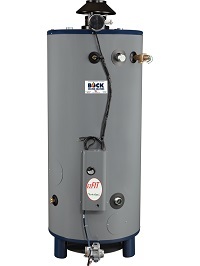 Available in 75, 80, 90 and 100 gallon capacities and inputs ranging from 76,000 to 199,000 BTU/HR. Low NOx emissions (SCAQMD certified) standard with EZ75-135N, EZ80-156N, EZ80-199N and EZ100-199N models.